I clearly prefer a photographic world without the presence of people. There is something about an empty plaza, or a blank hallway or a quiet vista that speaks so loudly to me. It’s not that I don’t like people (quite the contrary infact), but rather that I like the challenge of taking subject-free pictures in places that are otherwise bustling with activity. Nevertheless, I do have a few choice ‘people’ shots—and today’s snapshot is one of them. The brothers Bradshaw! My younger brother and I lead very different lives, in very different places. We continue to learn from each other’s mistakes and successes, and stay surprisingly close despite the distance. But one thing is for certain… we know how to have a good time when we get together! 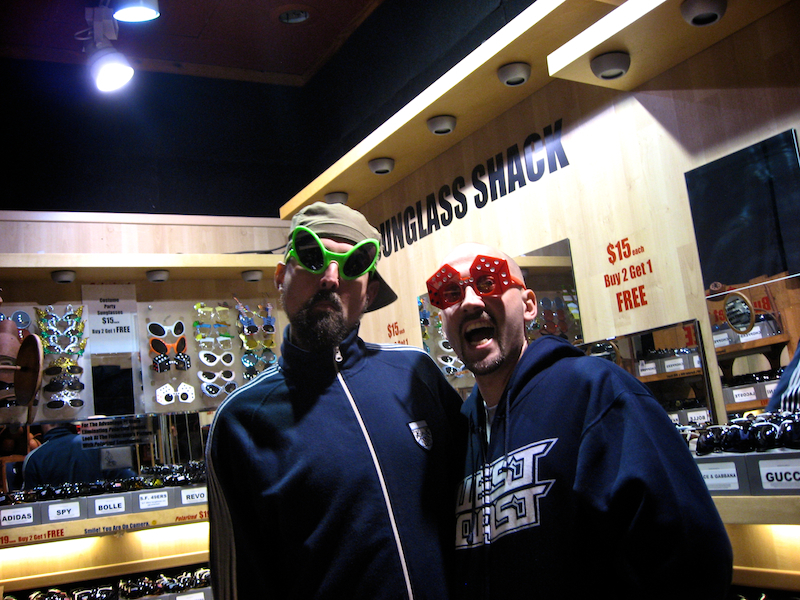 And this is one of my favorite shots from a recent visit: muggin’ for the camera at the local Funglass Shack (wearing wacky sunglasses with matching expressions)! i love your site. i like your pictures. especially this one. in fact i’ve used the same wordpress template for my photo-blog. Thanks Sean!! This was an experiment I wanted to test out. Kinda ran out of steam. I have focused more of my creative personal posting on to http://kc.br4dsh4w.com as time hasn’t allowed me to update this site as I wanted to. Good while it lasted though.